The “world’s loneliest elephant” lived ALONE for over 60 years in a barren, concrete prison at Inokashira Park Zoo in Tokyo, Japan. A campaign and petition were launched in 2016 to help her have a better life, but she died before she had a chance. 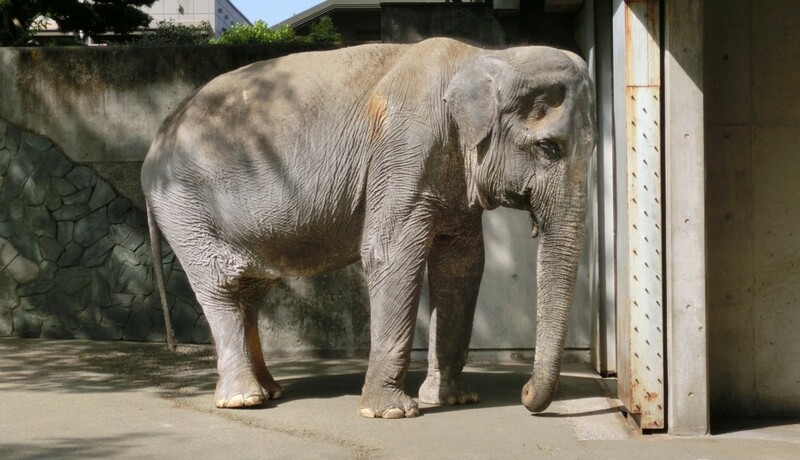 When Ulara Nakagawa first wrote about the world’s loneliest elephant, Hanako, on her blog in late 2015, she had no idea Hanako’s plight would resonate with people across the world. The Japanese-Canadian media and communications professional simply knew there was something deeply tragic about a sentient wild animal living alone in a barren concrete prison for more than 60 years. Rita Claessens—a retired schoolteacher and passionate elephant advocate from Belgium—read Ulara’s post and made an online petition demanding change for Hanako. Within a few months, a staggering 460,000 people had signed it. A media storm on Hanako’s plight came simultaneously. 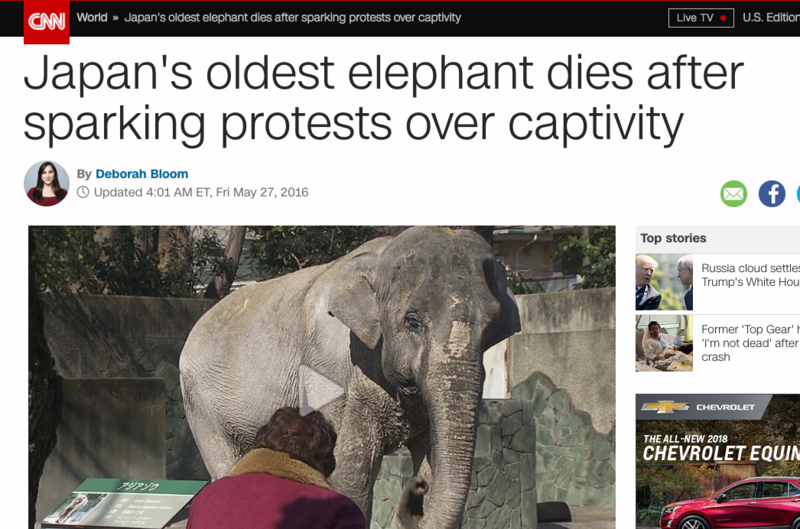 Articles with headlines like “The World’s Loneliest Elephant” were published by some of the world’s top media including CNN, The Washington Post and The New York Times. Hanako’s story had struck a chord with people everywhere. It makes sense. After all, with the proliferation of digital technologies in recent years—including the Internet and social media—word is spreading that elephants are amazingly complex, highly intelligent, exceptionally social animals who have families and friends and who grieve their dead. Elephants have come to take up a special place in people’s hearts. 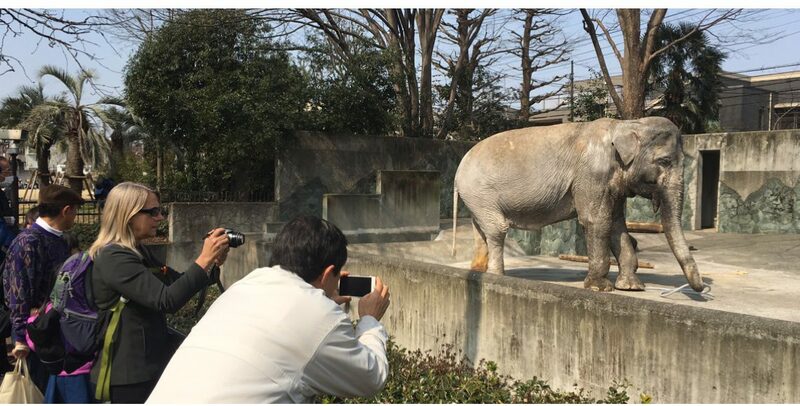 With the worldwide attention on Hanako, Ulara launched a grassroots crowdfunding campaign to “Help Hanako” and it was successful enough that a visit to the Inokashira Park Zoo, accompanied by elephant welfare consultant Carol Buckley, was arranged. Carol Buckley observing Hanako firsthand, March 2016. During that visit, they saw Hanako in the flesh for the first time and also met with the zoo management and staff, including Hanako’s own caretakers. Carol Buckley assessed Hanako’s situation and produced a report with a series of recommendations to improve her welfare in the short, medium and long term. She also determined what many experts had already suspected. 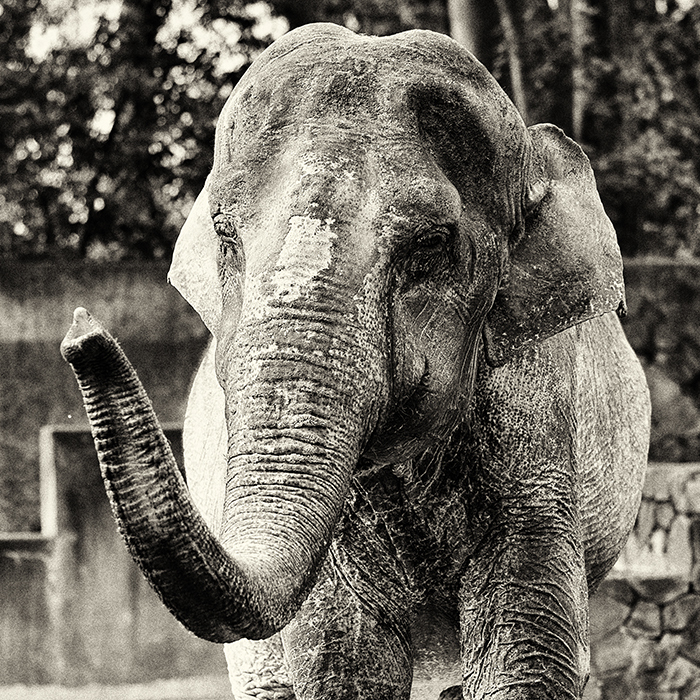 Hanako, at 68 years, was simply too old to survive a journey to an elephant sanctuary overseas. But Ulara still wanted to help Hanako and make her life better. So she was delighted when the Inokashira Park Zoo publicly committed to making many of the husbandry and care improvements recommended in the report. Sadly, on the morning of May 26, 2016, before most of the improvements could be made, Hanako collapsed. She passed away that afternoon at the age of 69, reportedly from heart failure. Her long, sad ordeal was finally over and thousands of people around the world mourned her death. The Elephants in Japan: In Memory of Hanako campaign was created to shed light on the other ‘Hanakos’ in Japan and around the world. While it was too late to save Hanako, it is not too late for countless other elephants that need our help. Today, Elephants in Japan has partnered with the international wildlife protection organization Zoocheck in an effort to improve the lives of solitary captive elephants in Japan. We will push for an end to the keeping of solitary elephants and work toward broader reforms in Japanese elephant keeping.